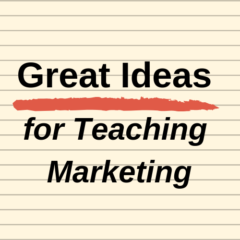 This activity is designed for students of marketing strategy, or advanced marketing students. It explores the concept of core competencies and their role in the development of a marketing strategy. Can a CFO run marketing? Preferred format: This teaching activity is designed to be completed in small groups of students or as a class discussion. Student audience: This exercise is more suitable for more advanced students of marketing, starting to think about their marketing career. Preferred format: This teaching activity is designed for small groups of students to split two products into the five product levels.